Is this trip really necessary? asks a road sign. Sure, it's necessary, replies Woody Woodpecker. I'm a necessary evil. Patriotic gestures are evidently not Woody's strong suit. When he goes to the gas station for a refill, he doesn't even know what a ration book is. The attendant thinks Woody is a wise guy and takes a large mallet and knocks him and his car into a junkyard several miles away. What luck! The old cars still have a bit of gas in them. 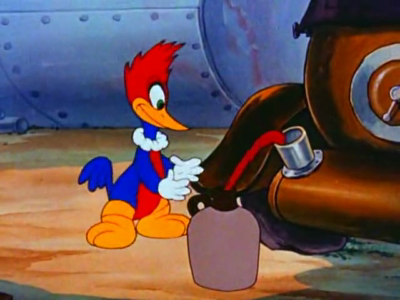 Woody takes a rubber hose and siphons the gasoline from some of them. Unluckily, one of the cars he picks is brand new. And it's a cop car. Woody is soon at odds with a bulldog police officer.